Yes, my engineering side shows in this article’s title, what can I say? The day our bees arrived we took off work early to drive down to Virginia Bee Supply to pick up our two packages and equipment. Picking out our packages was a very unceremonious process, we gave our names and then were told to grab two packages from the trailer covered in bee packages. 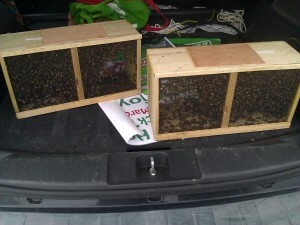 We had no idea what to look for so I looked around a little bit and picked out a couple packages that seemed to have fewer dead bees on the bottom and felt heavier than the others and put it in the back of our car. We then went to the back shed (which is the main store room for the business) and picked up our jacket, brush, and smoker. If I said we were not nervous about this whole thing I’d be lying. We had no idea how secure the packages were or how sensitive they were to movement, so the drive home was very delicate. A couple bees were spotted on the inside of our windows while we were driving but they were probably outside the packages to begin with and just tagged along when we put them in our car. 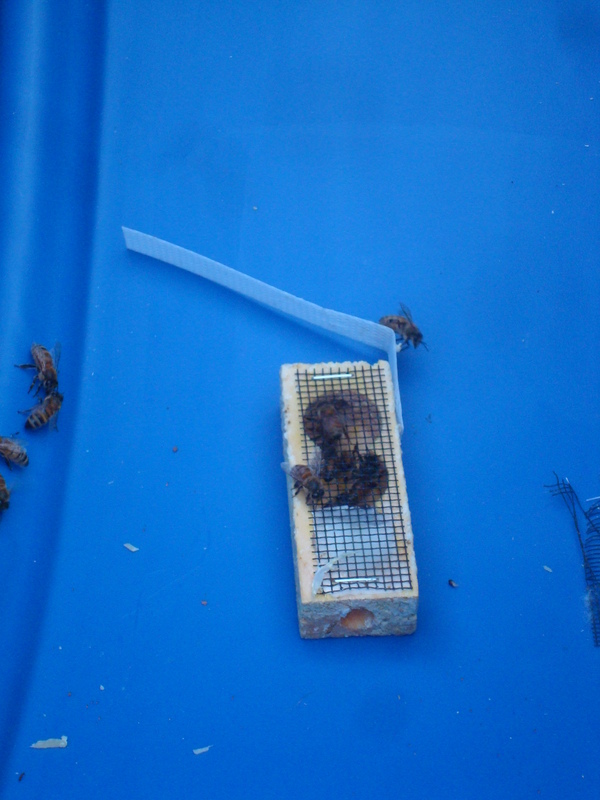 We have since learned that we had nothing to worry about, these bees have been very docile since we’ve had them. Once home we took the bees around to our backyard and immediately sprayed them with the sugar syrup we made earlier to give them a little extra food and calm them down. The syrup sticks to their wings and bodies so they are less active as they lick it off. A friend we met at the beekeeping club volunteered to help us with the bee installation so we gave him a call and waited for him to arrive. Our plan was to install the bees in the evening as close to dusk as possible. This was so that the bees would feel that it was time to stay inside and not go wondering away from their new home and risk getting lost or going back to the wrong hive. 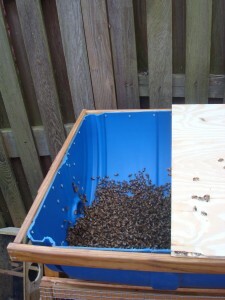 Right about 6:30 we began the process of releasing the bees into their new homes. 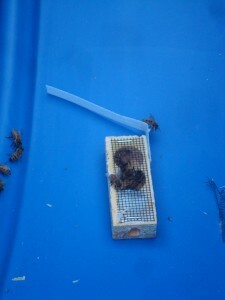 The first step in the process was to remove the queen cage. Starting off we sprayed the packages again with more syrup. Next, we pried the wood lid off the package, this exposed a plastic strap which we loosened from the package and held onto while lifting the feeder can out of the package. As soon as the feeder was clear we gave the queen cage strap a good shake to get any bees on the exterior off and removed it from the package. We quickly put the original cover back on the entrance to keep the bees inside. The queen cage has two entrances which have little corks covering them initially. One entrance has a little piece of candy on the inside which the bees eat through eventually to let the queen out. 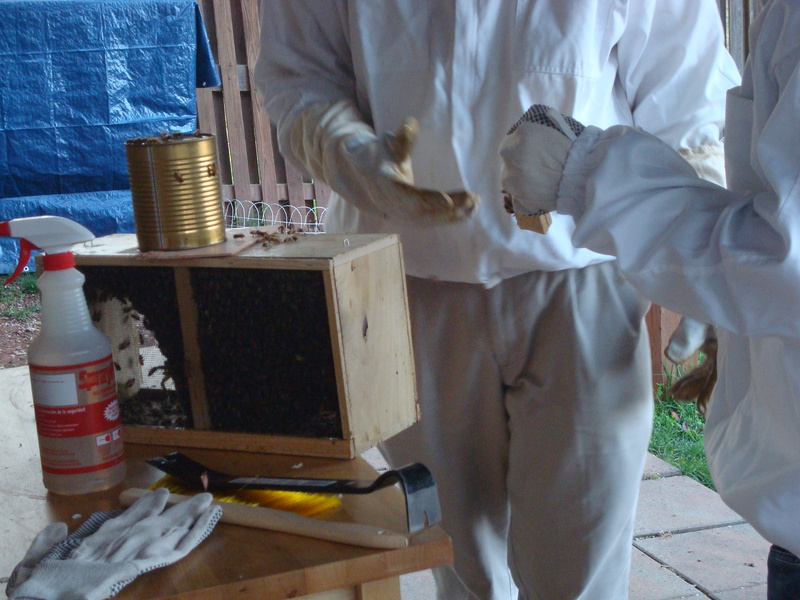 We popped the cork off the entrance with the candy and set the queen cages in the base of the hive. 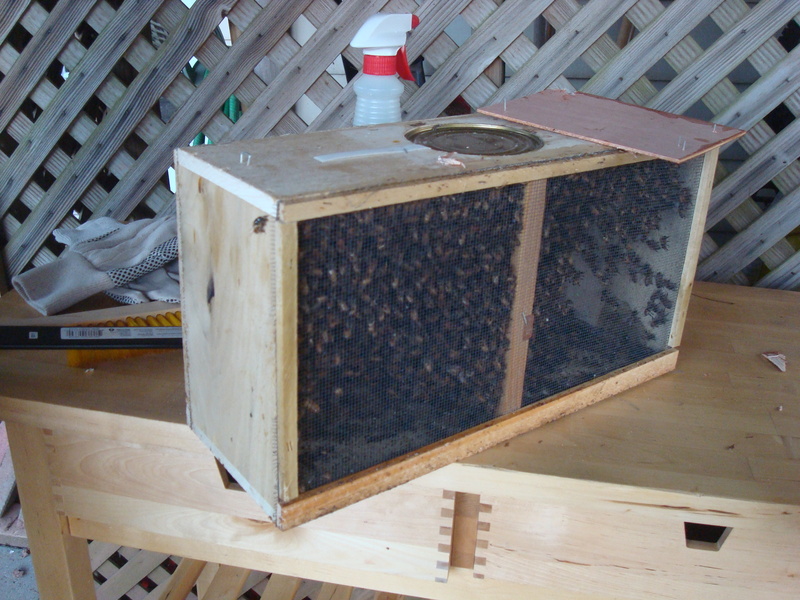 Some people hang the cages but for top bar hives this is not recommended as it may cause the bees to draw crooked comb around the hanging cage. With the queen in position we then took the package over to the hive where we first tapped the package on the edge of the hive to loosen the bees from the sides then took off the lid and flipped it over, shaking the bees into the hive over where the queen cage rested. I just kept shaking until most of the bees were in the hive. They all just settled there since we had sprayed them with so much syrup that they had a hard time flying. 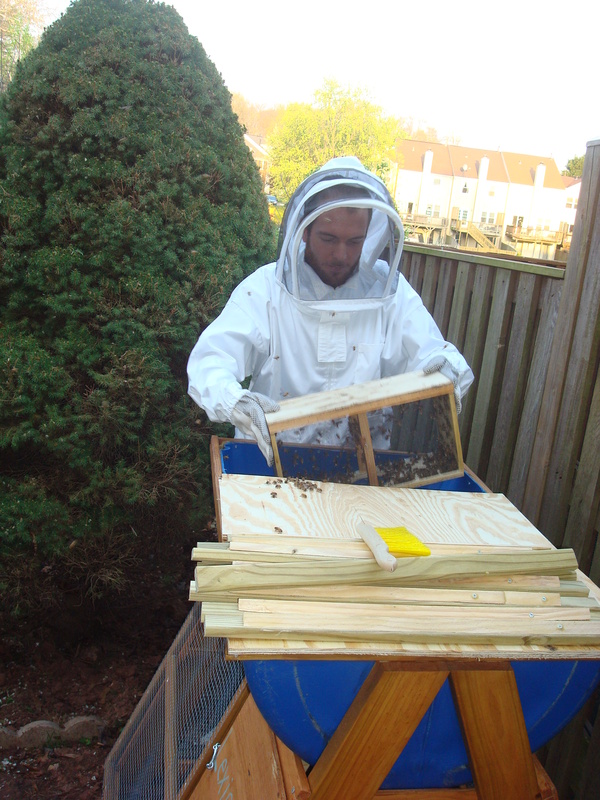 Once they were all shaken down into the hive we put the top bars back over the area between the entrance and the divider and covered up the hive. There were still a few bees in the package so we just set it on the ground next to the hive. The remaining bees would eventually find their way into the hive by the queen’s scent. That’s pretty much it! It was completely painless, no one got stung, the bees stayed where they were supposed to and it all worked as planned. We are really thankful to our friend Tim who mentored us through this process, his advice and assistance has really made this process a lot easier for us. If you can find someone near you to mentor you in your process we highly recommend it. If you are in the Northern Virginia area and would like help, we’d be happy to help you, just post a comment and let us know! 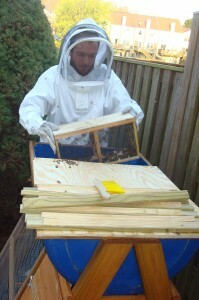 You can watch the video below of our hives just after we finished this process. 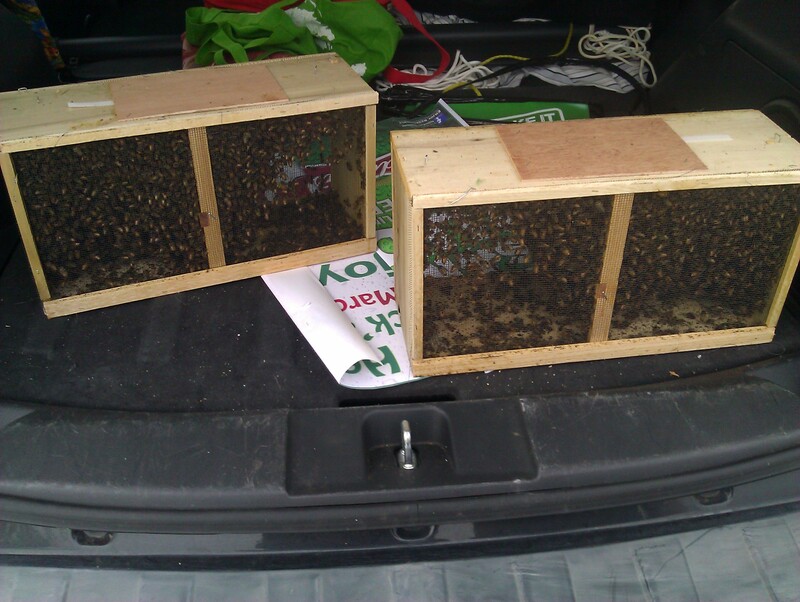 Be sure to check back later to see how our bees progress!